Right off the bat, we have some great news for you: It’s completely possible to get that chicken insurance that you’ve been searching so long for. What if your significant other gets cold feet right before your wedding date? As completely tragic as that hypothetical sounds, cold feet wedding insurance also exists. Isn’t it good to know that you’re covered for even the most trivial or unlikely matters? While your Ottawa home and auto insurance professionals at Bradley’s Insurance might not be able to protect you in the event of sudden heartbreak at the altar, we do offer an impressive and comprehensive range of insurance services to protect you, your family, and your valued assets. 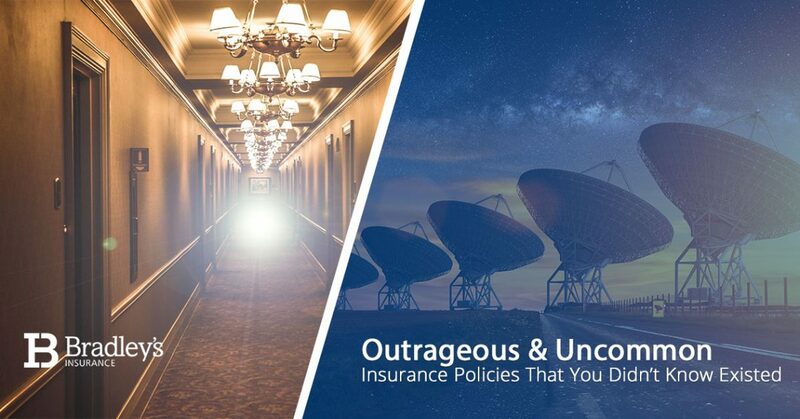 So, in the name of all that is insurance-related, we’re going to briefly cover some interesting personal insurance policies that…well, exist in today’s world. For more common insurance policies like high-value home insurance, auto insurance, home insurance or umbrella insurance to bundle home and auto insurance in Ottawa, Bradley’s Insurance would love to work with you. Learn more about our family-run local business today and continue reading below to get some kicks out of today’s blog post. It happens to the best of us. No one particularly enjoys getting spooked out, and for those that are especially in-tune with the paranormal, rest assured that your rest is literally insured in the event of a ghost encounter. Well, our Ottawa insurance providers aren’t exactly sure how this policy operates, but it’s real. Indeed, a hotel owner in England actually purchased a policy after hearing stories from hotel guests about seeing ghosts on the premises. The policy, as is turns out, essentially stated that a payout would be made in the event that someone was killed or permanently disabled by a ghost while on the premises. Honestly, we’re not exactly sure what to make of that. Yes, it gets more interesting (and a little more ridiculous) from here. Apparently, over some 20,000 individuals have made a one-time payment of $19.95 – a true bargain compared to $20 – to the Saint Lawrence Agency in Sarasota, Florida. The policy is said to cover people up to an impressive $10 million in damages in the unfortunate event that you’re abducted by aliens. How you actually prove this, let alone collect your payout after being hoisted up into space, is completely beyond us. Officially regarded as “social host liquor liability coverage”, this policy covers damages suffered in the event that an intoxicated party guest causes damage to property or to an individual. An important thing to take note here is that, depending on your homeowners’ insurance policy in Ottawa or Stittsville, this usually covers incidents like these. Sure enough, there are many novel and strange insurance policies on the market. When it comes to just about any and every standard policy, in addition to a number of specialized insurance services that we’ve touched on in the past, Bradley’s Insurance has you protected. Contact us today for a home and auto insurance bundle in Ottawa.